Discussed are Treaty of New Echota and Indian Removal Acts, including the Treaty's purpose, terms, articles, conditions, significance, and the final result of Indian Removal. The political details and objectives of the 1835 Treaty of New Echota, year treaty was proposed, date ratified, and year enforcement was abandoned, are viewed with the backdrop of gold as a driving force. Failure to enforce and uphold the Treaty are also explained, because the result was mass Indian Removal from ancestral lands. The original document and a copy of the president's 1830 Indian Removal Act are enclosed. The New Echota Treaty would become just one more discarded Treaty resembling the likes of previous agreements, but this time all Native Americans were forced from their ancestral homelands and onto unfamiliar and loathsome locations. The Treaty of New Echota was a Cherokee Indian removal treaty signed in New Echota, Georgia, by officials of the United States government and several members of the so-called Ridge faction within the Cherokee Nation on December 29, 1835. The Ridge faction, aka Ridge Party, which represented a minority faction of the Cherokee, believed that the Cherokee would eventually lose their eastern lands and that removal to the west was the only way to preserve the Nation. The Ross Party, which represented the Cherokee majority, however, argued that the Cherokee Nation should remain in its current homeland and that the recent U.S. Supreme Court decision in Worcester vs. Georgia (1832) secured that right. In the case of Worcester vs. Georgia (1832) the U.S. Supreme Court ruled in favor of the Cherokee. The Supreme Court (this time) ruled that the Cherokee Nation was sovereign, thus making the removal laws invalid. The decision, rendered by Justice John Marshall, declared that the forced removal of the Cherokee Nation to be illegal, unconstitutional, and against treaties made. President Andrew Jackson, who had the executive responsibility of enforcement of the laws and treaties, stated: "John Marshall has made his decision; let him enforce it now if he can." John Ross believed that the recent U.S. Supreme Court decision had secured the Cherokee a resounding victory, and that if the Indians held out until Jackson's successor, that perhaps the new administration would support and enforce the Cherokee right to remain in its lawful homeland and to retain its Cherokee Nation status. 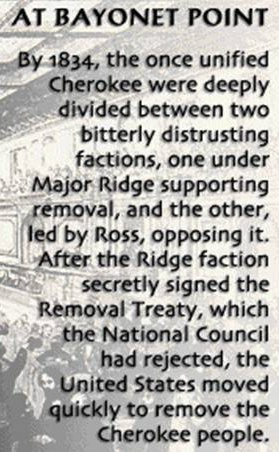 The Ross majority, moreover, believed that the Ridge minority did not represent the Cherokee, and that the Treaty of New Echota was therefore null and void. Any Cherokee that ceded (any) Cherokee land without tribal approval faced a death sentence - hence, the Cherokee nation was now split. A minority embraced Ridge, while the majority supported Ross. The Cherokee nation hereby cede relinquish and convey to the United States all the lands owned claimed or possessed by them east of the Mississippi river, and hereby release all their claims upon the United States for spoliations of every kind for and in consideration of the sum of five millions of dollars to be expended paid and invested in the manner stipulated and agreed upon in the following articles But as a question has arisen between the commissioners and the Cherokees whether the Senate in their resolution by which they advised “that a sum not exceeding five millions of dollars be paid to the Cherokee Indians for all their lands and possessions east of the Mississippi river” have included and made any allowance or consideration for claims for spoliations it is therefore agreed on the part of the United States that this question shall be again submitted to the Senate for their consideration and decision and if no allowance was made for spoliations that then an additional sum of three hundred thousand dollars be allowed for the same. In order to make a final settlement of all the claims of the Cherokees for reservations granted under former treaties to any individuals belonging to the nation by the United States it is therefore hereby stipulated and agreed and expressly understood by the parties to this treaty—that all the Cherokees and their heirs and descendants to whom any reservations have been made under any former treaties with the United States, and who have not sold or conveyed the same by deed or otherwise and who in the opinion of the commissioners have complied with the terms on which the reservations were granted as far as practicable in the several cases; and which reservations have since been sold by the United States shall constitute a just claim against the United States and the original reservee or their heirs or descendants shall be entitled to receive the present value thereof from the United States as unimproved lands. And all such reservations as have not been sold by the United States and where the terms on which the reservations were made in the opinion of the commissioners have been complied with as far as practicable, they or their heirs or descendants shall be entitled to the same. They are hereby granted and confirmed to them—and also all persons who were entitled to reservations under the treaty of 1817 and who as far as practicable in the opinion of the commissioners, have complied with the stipulations of said treaty, although by the treaty of 1819 such reservations were included in the unceded lands belonging to the Cherokee nation are hereby confirmed to them and they shall be entitled to receive a grant for the same. And all such reservees as were obliged by the laws of the States in which their reservations were situated, to abandon the same or purchase them from the States shall be deemed to have a just claim against the United States for the amount by them paid to the States with interest thereon for such reservations and if obliged to abandon the same, to the present value of such reservations as unimproved lands but in all cases where the reservees have sold their reservations or any part thereof and conveyed the same by deed or otherwise and have been paid for the same, they their heirs or descendants or their assigns shall not be considered as having any claims upon the United States under this article of the treaty nor be entitled to receive any compensation for the lands thus disposed of. It is expressly understood by the parties to this treaty that the amount to be allowed for reservations under this article shall not be deducted out of the consideration money allowed to the Cherokees for their claims for spoilations and the cession of their lands; but the same is to be paid for independently by the United States as it is only a just fulfillment of former treaty stipulations. Whereas the Cherokee people have supposed that the sum of five millions of dollars fixed by the Senate in their resolution of——day of March, 1835, as the value of the Cherokee lands and possessions east of the Mississippi river was not intended to include the amount which may be required to remove them, nor the value of certain claims which many of their people had against citizens of the United States, which suggestion has been confirmed by the opinion expressed to the War Department by some of the Senators who voted upon the question and whereas the President is willing that this subject should be referred to the Senate for their consideration and if it was not intended by the Senate that the above-mentioned sum of five millions of dollars should include the objects herein specified that in that case such further provision should be made therefor as might appear to the Senate to be just. It is therefore agreed that the sum of six hundred thousand dollars shall be and the same is hereby allowed to the Cherokee people to include the expense of their removal, and all claims of every nature and description against the Government of the United States not herein otherwise expressly provided for, and to be in lieu of the said reservations and pre-emptions and of the sum of three hundred thousand dollars for spoliations described in the 1st article of the above-mentioned treaty. This sum of six hundred thousand dollars shall be applied and distributed agreeably to the provisions of the said treaty, and any surplus which may remain after removal and payment of the claims so ascertained shall be turned over and belong to the education fund. But it is expressly understood that the subject of this article is merely referred hereby to the consideration of the Senate and if they shall approve the same then this supplement shall remain part of the treaty. It is also understood that the provisions in article 16, for the agency reservation is not intended to interfere with the occupant right of any Cherokees should their improvement fall within the same. It is also understood and agreed, that the one hundred thousand dollars appropriated in article 12 for the poorer class of Cherokees and intended as a set-off to the pre-emption rights shall now be transferred from the funds of the nation and added to the general national fund of four hundred thousand dollars so as to make said fund equal to five hundred thousand dollars. Recommended Reading: The Five Civilized Tribes: Cherokee, Chickasaw, Choctaw, Creek, Seminole (Civilization of the American Indian) (455 pages: University of Oklahoma Press). Description: Fascinating and captivating study of the often referred to Five Civilized Tribes, with each tribe's: evolution, struggles, Indian removal, treaties, internal and external strife, and outlook...numerous maps and photographs compliment this research. By focusing on all 'Five Tribes' it also presents a better understanding of how the tribes interrelated in the Indian Territory (most of present-day Oklahoma). While most authors only focus on "a tribe" rather than "the tribes," Foreman, by interconnecting the tribes, conveys a more comprehensive understanding of the Five Nations.